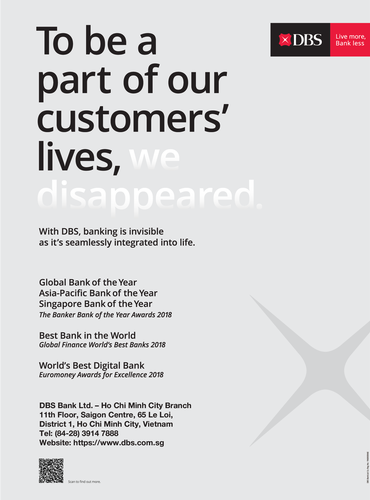 DBS is a leading financial services group in Asia, with over 280 branches across 18 markets, we are the largest bank in Singapore and Southeast Asia. Headquartered and listed in Singapore, DBS has a growing presence in the three key Asian axes of growth: Greater China, Southeast Asia and South Asia. The bank's capital position, as well as ''AA-'' and ''Aa1'' credit ratings, is among the highest in Asia-Pacific. DBS is honoured to be recognised as the Global Bank of the Year by The Banker, a member of the Financial Times Group, and Best Bank in the World by Global Finance in 2018. The bank has also been named Asia’s Safest Bank for 10 consecutive years by Global Finance from 2009 to 2018. Building and leveraging the strengths of its pan-Asia franchise, DBS Ho Chi Minh City branch was established in September 2010 to serve the banking needs of the bank’s local and foreign corporate customers operating in Vietnam. As a bank born and bred in Asia, DBS understands the intricacies of doing business in the region’s most dynamic markets and is committed to building lasting relationships with customers as they grow in the region.